We’d love your help. Let us know what’s wrong with this preview of How I Changed My Mind about Women in Leadership by Alan F. Johnson. To ask other readers questions about How I Changed My Mind about Women in Leadership, please sign up. 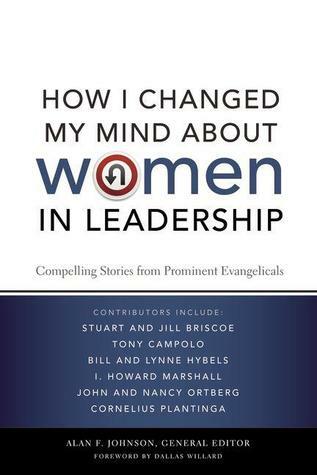 Short review: These are short essays by fairly prominent Evangelical leaders about how they changed their mind about women in leadership. All the essays are from people that were changing their mind from a more restrictive position to a less restrictive or open embrace of women in leadership. About half of the authors I was fairly familiar with and about half were pretty much unknown to me, but I was often aware of the organizations that they lead or work for. So there is real credibility in the Short review: These are short essays by fairly prominent Evangelical leaders about how they changed their mind about women in leadership. All the essays are from people that were changing their mind from a more restrictive position to a less restrictive or open embrace of women in leadership. About half of the authors I was fairly familiar with and about half were pretty much unknown to me, but I was often aware of the organizations that they lead or work for. So there is real credibility in the authors. The stories were a bit repetative (as you may expect) because the stories were often fairly similar. The authors grew up in conservative churches that believed that women should not lead men, they questioned the position or they observed how restricting women in leadership was harming the gospel, they spent time investigating scripture and talking to people that supported women in leadership and over time came to change their minds. If your objections to women in leadership are primarily Biblical/theological this book has a good summary of current scholarship about the matter. A couple of authors admitted that their prior objections were primarily cultural and not theological and I think that part of the story is important too. Wonderful book. I recommend it to anyone who wonders about whether or not women should have leadership positions in the church -- or anyone who thinks they shouldn't -- or anyone who believes they should....excellent book. Thank you, Alan, for writing it -- and hugs to Rea! I always knew there was something special about you two!! Another thing that struck me is that most of the people that wrote chapters are older than I am -- and I'm no young'un any more. I really appreciated hearing from those Wonderful book. I recommend it to anyone who wonders about whether or not women should have leadership positions in the church -- or anyone who thinks they shouldn't -- or anyone who believes they should....excellent book. Thank you, Alan, for writing it -- and hugs to Rea! I always knew there was something special about you two!! While this book doesn't walk through the biblical issues in a linear fashion, I do think there's great value in hearing people's stories. In such a polarized society, I think we probably don't spend enough time reading or hearing about people who have changed their mind on an important topic. I haven't read all of the testimonies here, but the ones I read represented a spectrum of backgrounds and were insightful. Rather than being an exhaustive exegetical review of the Biblical text as it relates to leadership structures within the church, How I Changed My Mind About Women in Leadership takes a more casual and experiential approach to the topic. It feels much more like a group of people sitting around the fire, sharing personal stories and anecdotes about themselves and how they came to see the role of women in the church today. It's a great introduction to the egalitarian position, especially if you app Rather than being an exhaustive exegetical review of the Biblical text as it relates to leadership structures within the church, How I Changed My Mind About Women in Leadership takes a more casual and experiential approach to the topic. It feels much more like a group of people sitting around the fire, sharing personal stories and anecdotes about themselves and how they came to see the role of women in the church today. It's a great introduction to the egalitarian position, especially if you approach it with an open mind and willingness to listen. Again, while this is is not a broad theological treatise, there are some high marks that were really important for me. The book is a collection of short testimonies from various people in the evangelical world. I was quite impressed by the selection of contributors: pastors, teachers, professors, speakers, scholars and business executives. They have all had exemplary lives, and have made much of what they've been given. The list of accolades is long and impressive. Even more so, each of them specifically expressed their love of God and his word, and their deep devotion to Biblical inerrancy. Many touched on specific arguments against egalitarianism that have been troubling for me, such as the risk of making the Bible say something it doesn't actually say, the risk of becoming too liberal with interpretation, or the risk of the issue of female leadership opening the door for a weakening towards other cultural issues that I think the Bible speaks exceedingly clear on. These arguments hold less water for me now. While I can't say that this book made a broad and sweeping change in my view, there were a number of points that really struck me as I read the book. One concerned the supposed "clarity" that many complementarian churches ascribe to the consideration of female leadership, clarity that just happens to spawn a wide variety of practices and rules across churches who in theory believe in the same "clear" issue. If the issue is so clear, why is there is so much debate and difference in implementation, even among churches who fall along the same lines? Furthermore, it's particularly obtuse how far some churches and denominations go in order to try to maintain their position despite some of the absurdity that results. Can a women speak in front of men? Well, maybe not, but hey, she could speak behind a curtain, or perhaps in a different room connected via a microphone and speaker. Or maybe all the men could be in the same room, as long as they face the opposite wall. Or perhaps she could speak during an interview-style format with a man on stage. But hey, aren't women heavily featured in many children's programs? So they can teach boys? But not men? At what age exactly does that become inappropriate? What verse did you get that from? Buy hey, women can be missionaries, right? We don't have a problem sending them overseas to a foreign nation, potentially with a risk of harm or death, to share the gospel. We're okay with that, right? But they can't preach at a western church? Okay, so they could teach the gospel to a black or brown man across the ocean, but not a white man at an American church? These types of stories in the book were extremely illuminating for me. Some of the places we (the global church) find ourselves in really fall down in light of honest, rational and logical examination. We need to be intellectually honest and be willing to admit when we get it wrong. Another striking point to me was many of the contributor's ruminations on Genesis 1 and 2, before sin enters the picture. There is an absence of hierarchy in these passages. God makes both man and women in his image. Both carry the Imago Dei. Even further, God gives both male and female the command to subdue the earth, and to be fruitful and multiply. These two early chapters in the Biblical text have become increasingly important to me over the years, as they reveal God's intent for humanity and human flourishing, before sin marred that ideal in any way. These passages should inform our view of male and female roles and relationships. Many of the authors talk about denominations and traditions I am less familiar with, denominations that seem truly archaic to me, in terms of how they contextualize the gospel for the world in which we now live. For example, head coverings have not been an issue in any single church I've ever been a part of, but it apparently is still an issue for some. Yet, even in the churches I've called home, it again is troubling that such priority is given to a single verse about women having authority over men, but the same priority is not given to the single verse about head coverings. Why one and not the other? Speaking of verses, many of the authors do deal specifically with some of the ones that have been stumbling blocks, such as 1 Timothy 2 and Ephesians 5. In all honesty, these areas are less problematic for me. One verse from Paul about women not having authority over a man does NOT meet my own personal criteria for an eternal principle for human flourishing. There are many New Testament verses that speak of slavery in a similar fashion, but I don't think nearly anyone would simply pull those out of context to justify the continued practice of one human enslaving another. Yet we do just that regarding female leadership. However, I did want some authors to speak to the passages on requirements for elders, in 1 Timothy 3 and Titus 1. This was notably absent, which was disappointing. Many of the contributors also speak not only of leadership in the church but of the role of men and women in marriage, and in these places, I have very little resistance. At the core of my beliefs, I have always viewed marriage as a partnership. I have not always acted in accordance with this view, because I did grow up in a home that was male-lead, and have also been in churches where women were not allowed to become elders. Those environments have pressed upon me some subtle and not-so-subtle ways in which I interact with my wife with the assumption that I hold the leadership role. I think I have used this approach in positive and negative ways over the years, but at the deepest level, I'd prefer a partnership with Ciara. So I agree with the authors. One of the most common arguments used in favor of husband-focused leadership is the scenario where man and wife cannot agree, and someone needs to make the decision. What an eye-opening experience it was to realize, through the authors of this book, that this scenario almost never occurs in most marriages! It's laughable to think now why that one specific and rare situation has been used to justify such a massive view on marriage. In almost a decade of marriage, this scenario has not occurred even one time, and if it did, I would take the position posited by one of the authors: if you can't decide, then wait until you can. Or, perhaps, I would actually follow ALL of the instruction of Ephesians 5, to be the head of my wife by dying to myself and laying down my life for her, as Christ does the church. It seems that headship implies that we as husbands would more often than not be doing the things our wives request. In the end, what How I Changed My Mind about Women in Leadership did for me was to truly cement the whole topic as an open-handed issue for me. It really is. It's not an issue I feel the church should divide over. I know many, many people who deeply and authentically love Jesus and his Bible, and land on complementarianism as well as many who land on egalitarianism. I think I could love and serve a church who falls on either divide. However, what this book also solidified for me is something that is no longer an open-handed issue for me, and that is the voice of women in the church. Even if a church honestly evaluates the text and decides that the role of elder is for men and not for women, women ABSOLUTELY must have loud, strong and prominent voice into the decisions, direction and vision of the church. Anything less falls dramatically short of God's intent for his church and his world. We cannot simply cast aside literally half the church, with all of their giftings and callings and abilities. Any church that is not encouraging women, listening to them, empowering them, discipling them, and and allowing to serve at some level of leadership is falling drastically short of the kind of church that God calls us to be. First, a disclaimer: I am currently in a season in my life where I am truly trying to gain an unbiased understanding on gender roles in the church and family. For all of my Christian life (over 20+ years) I have been a complementarian, ascribing to the belief that men and women have different but complementary roles and responsibilities both in the home and the church, precluding women from ecclesiastical leadership roles. However, over the past couple of years, due to a variety of reasons, I ha First, a disclaimer: I am currently in a season in my life where I am truly trying to gain an unbiased understanding on gender roles in the church and family. For all of my Christian life (over 20+ years) I have been a complementarian, ascribing to the belief that men and women have different but complementary roles and responsibilities both in the home and the church, precluding women from ecclesiastical leadership roles. However, over the past couple of years, due to a variety of reasons, I have begun to come away from this view and open to a more egalitarian view. I am still sitting on the proverbial fence on this issue. I have not been thoroughly convinced yet that egalitarianism is truly the biblical way nor am I thoroughly convinced the complementarian view is either. It was therefore recommended to me by a couple of individuals that I should read "How I Changed My Mind About Women in Leadership". I was almost assured that this book would more or less bring it home for me and that I would likely become convinced that the egalitarian view is indeed the answer. Well, I have read it and I was disappointed. It seemed to me that many of the testimonies contained within this book were drawn from human emotion (not that it's bad). That it was more or less based on a "gut feeling" which inevitably propelled many of the women into leadership roles and changed many of the mens' views on the issue. Most of the stories told of how a woman "felt" or that she was not "feeling" as if she was doing what God wanted her to do. Or, that she was raised in a very strict ultra-conservative home and merely wanted to shed her parents old ways. In other words, the biblical precedence for an egalitarian view were minimal. However, Tony Campolo (in chapter 5) provided what I believe was the most compelling reason why he has chosen to believe women can serve in leadership roles in the church. He provided plenty of scriptural references with a healthy dose of proper hermeneutics and cultural contextualization. After reading Campolo's take on the matter I was more convinced that the Bible does allow for women in church leadership roles. But, Campolo and perhaps Nicole (chapter 13) were a rarity in a book comprised of nearly 300 pages. The book lacks strong scriptural support, at least in proportion to the numerous non-biblical references by at least 5 to 1. There were entire chapters void of scriptural references that bothered me. While I don't discount feelings, after all God created the human emotion, they must align with scripture especially if the issue is regarding matters of ecclesiology. And, even the biblical references that were often repeatedly used throughout the book, were a bit ambiguous. While I still remain sitting on the fence on this issue, this book hasn't prodded me to jump off to the side of egalitarianism quite yet. This book tells the stories of theologians/pastors/seminary professors who changed their minds about women in church leadership. Most of the writers conclude that marriage is a matter of mutual submission and partnership, rather than a hierarchy. However, every writer holds a different view of women in leadership, the varying degrees of which a woman can lead in the church, and woman's "true roles." While about 1/3 of the essays are written women, including the chapters written where she is part This book tells the stories of theologians/pastors/seminary professors who changed their minds about women in church leadership. Most of the writers conclude that marriage is a matter of mutual submission and partnership, rather than a hierarchy. However, every writer holds a different view of women in leadership, the varying degrees of which a woman can lead in the church, and woman's "true roles." While about 1/3 of the essays are written women, including the chapters written where she is part of a marriage team, most of the perspectives present views from men. (But I believe men are the target audience of this book, so this strategy seems to make sense in that context.) Though some men arrogantly proclaim their humble revelations about scripture, most of the writers humbly present the case for a woman's right to be more active in church leadership. These men with a heart for God are horrified at how women have been treated over the centuries and how the world's sinful view of women has infiltrated the church's very structure. From a writer's perspective, the quality of each essay varies as much as the views of the writers, and this book presents a series a mini biographies instead of focusing on selected arguments. Those seeking to read more about this topic should probably skim this book, reading select essays, rather than reading the book in its entirety. I highly recommend this book as a primer on biblical egalitarianism and its implications for the life of the church. Especially relevant for anyone accustomed to patriarchy or plagued by nagging questions. Tony Campolo's contribution is quite a scorcher; read it when you are ready to have your eyebrows singed. One of the most eye-opening books to me as a female follower of Christ. Absolutely 100% loved the affirmation I received from it. Love this book! What was great about it was that so many people had so many different ways that they had explored the biblical principles of women in leadership. Non-religious people often seem to have this idea that Christians are stubbornly unable to change their minds about what they believe. That may be true sometimes... but most of the time, the problem is not understanding what could make a passionate or person change their minds. This book therefore does something crucial: helping us understand (autobiographically!) people's journeys in changing their minds about gender roles in the bible (mainly in ministry, and also to a lesser extent in marriag Non-religious people often seem to have this idea that Christians are stubbornly unable to change their minds about what they believe. That may be true sometimes... but most of the time, the problem is not understanding what could make a passionate or person change their minds. This book therefore does something crucial: helping us understand (autobiographically!) people's journeys in changing their minds about gender roles in the bible (mainly in ministry, and also to a lesser extent in marriage). There are people in this book who go from pretty patriarchal to pretty not-patriarchal over the course of their lives. How interesting is that? The journey of discovery that happens afterwards HAS to include some kind of theoretical / theological reorienting, otherwise it just feels like compromise or selling out. This is also something super important, if you want to convince someone of something important. Defeating or humiliating someone's perspective just makes them hold on more tightly, I think. Probably the best thing to do is to show them that it's not necessary to hold onto their old perspectives to be a good person, or maybe that a new position fits even better with what they most fundamentally believe than the old thing. I've recently started a project on Women's Issues Within Messianic Judaism, & this book had been recommended to me by Rabbi Jake Rosenberg as a resource that meant a lot to him. It's amazing how many of these authors John & I have met, talked with, and/or were friends of friends of ours. So I was very happy to see their views in print after all these years, and was not surprised at all by their stories. Very informative for anyone, male or female, who wishes to search out why women can be I've recently started a project on Women's Issues Within Messianic Judaism, & this book had been recommended to me by Rabbi Jake Rosenberg as a resource that meant a lot to him. Very informative for anyone, male or female, who wishes to search out why women can be allowed biblically to speak in a church (or a Messianic congregation), lead adult bible studies, serve on congregation "elder boards" (zakenim), and eventually to ordination if desired. There is 1 giant black blot on some of these arguments. Some of these writers use Judaism as a "whipping boy" in building their argument. They portray Yeshua's ministry as the solution to wrong/bad viewpoints within Judaism concerning women during the Second Temple Era. They quote rabbis' texts without knowing the context, and cite Middle Ages Jewish practice as though it was Second Temple practice. While I wish this book were beefier and included younger contributors, I am appreciative of those that took the time to tell their story. There are themes that come up again and again, but there is a good diversity of testimonial, autobiography, theology, and biblical reflection in the contexts of many different kinds of leadership. I will admit I threw this book across the room at least 3 times. I believe in women in leadership but the "before" stories made me so mad. I finally made it to the second part of each story but it took awhile. helpful read as I consider more deeply by own experiences in parachurch ministry over the past 15 years and my leadership in my local church and community. Thankful for this who have invested and advocated for me and feel burdened to do the same for younger women. Some of the essays are superb and others just OK. Overall, it's worth a read. Absolutely one of the best books i have read on this subject. A must for every Christian exploring this topic. Strength: Many testimonies of how people in christian leadership moved from a restrictive mindset to an inclusive mindset regarding women in "titled" christian leadership. Weakness/Strength: Some of the chapters seemed redundant and it took a lot of effort to push through and read yet another chapter that seemed to say the same thing. Yet, this was such an encouragement as I heard person after person testify how God walked with them by highlighting truth and exposing cul This was an amazing book! Weakness/Strength: Some of the chapters seemed redundant and it took a lot of effort to push through and read yet another chapter that seemed to say the same thing. Yet, this was such an encouragement as I heard person after person testify how God walked with them by highlighting truth and exposing cultural influences. The overall truth from this book is that women have always served in the church and have been recognized as major contributors to the life and well-being in the church, but in unofficial capacities. This book talks about many christian leaders journey from recognizing what is "already there" behind-the-scenes and bringing it to the forefront in honor. I appreciate how this is a collection from many christian leaders and their journey of internal wrestling in the area of women in leadership. These leaders were authentic as they wrestled to find God's perspective. Some of the writers approached from a theological perspective, some from an experiential perspective, and some from a missions perspective. Their journeys are very illuminating! I'm thankful for this book. It was so good to hear intelligent, theological standpoints from respected church and ministry leaders on the matter of women in leadership and the roles of husbands and wives, instead of mere opinions from hippie chick bloggers. Instead of trying to push a feminist agenda, these writers (men and women from all ages and backgrounds) are most concerned with communicating their interpretation of God's intended design for men and women that brings Him the most glory. Pra I'm thankful for this book. It was so good to hear intelligent, theological standpoints from respected church and ministry leaders on the matter of women in leadership and the roles of husbands and wives, instead of mere opinions from hippie chick bloggers. Instead of trying to push a feminist agenda, these writers (men and women from all ages and backgrounds) are most concerned with communicating their interpretation of God's intended design for men and women that brings Him the most glory. Praise the Lord. There's not a lot of hermeneutical discussion, but they list a lot of resources (my favorite was an article by N.T. Wright) that go into greater depths interpreting passages about slavery, creation and the fall, the culture of the New Testament, and Paul's most debated statements, if you want to go deeper. I didn't agree with all of their opinions. But I felt this book offered more solid foundation than a lot I've read lately. Wow, I know a lot of people who need to read this book! For me personally, it gave me some hope that there are some evangelical churches out there that are more accepting and sympathetic to women in leadership. It would be great if this were required reading for male church leaders. Simply put, the book is over 20 evangelical thinkers writing on exactly what the title describes. Many of the authors make the same essential argument, so it can be a bit redundant at times. However, the personal sto Wow, I know a lot of people who need to read this book! For me personally, it gave me some hope that there are some evangelical churches out there that are more accepting and sympathetic to women in leadership. It would be great if this were required reading for male church leaders. I wrote my PhD dissertation on this very subject -- a new topic and my research was called out in an article on Christianity Today -- but I'm not even in the footnotes of this book. Where have these people been all my professional life? Certainly not present and supportive. Although they're only talking about about female preachers, I want to believe it extrapolates larger. Welcome to the real world, people. Although I do recommend Tony Campola's chapter. These are not new insights to him. I've k I wrote my PhD dissertation on this very subject -- a new topic and my research was called out in an article on Christianity Today -- but I'm not even in the footnotes of this book. Where have these people been all my professional life? Certainly not present and supportive. The book contains many stories outlining why leaders have changed their mind about women in church leadership. The stories are helpful reinforcement for those who are struggling with the topic. It is also helpful for those who are being oppressed because of their views on the topic. Despite this, the book is too long and many of the stories have little significant impact. It could have reduced down by 100 pages and been more effective. There are better books on the topic. Save your money for the The book contains many stories outlining why leaders have changed their mind about women in church leadership. The stories are helpful reinforcement for those who are struggling with the topic. It is also helpful for those who are being oppressed because of their views on the topic. This was a very interesting read by someone who was brought up, and spent their adult life in churches who put forward that women don't have a place in church leadership. The many authors point out the gross inconsistancies churches have in regard to this. I didn't really need convincing, although I never had a real strong opinion about this because I had no desire to be in a leadership - or heaven forbid preaching position. I found the arguments very valid and those who believe women should "be This was a very interesting read by someone who was brought up, and spent their adult life in churches who put forward that women don't have a place in church leadership. The many authors point out the gross inconsistancies churches have in regard to this. Highly recommend this book! Probably not for someone who wants a reasoned theological argument, although the various authors make reference to theology. I appreciated the very human, hearts full of love for God and his people reasoning. Not at all "unscriptural," just a different starting point than the usual arguments. I have to say that I often weary of this discussion, having grown up in a church led by a wonderful woman, whose entire life was a testament to the validity of the fact that God d Highly recommend this book! Probably not for someone who wants a reasoned theological argument, although the various authors make reference to theology. I appreciated the very human, hearts full of love for God and his people reasoning. Not at all "unscriptural," just a different starting point than the usual arguments. This book thoughtfully and clearly traces the journeys of many, many non-heretical evangelical believers from some form of patriarchal thought system to a more egalitarian thought system about God's design for "gender roles"'. Perhaps the best thoughts I've come away with are 1) that God doesn't specifically address gender roles much in scripture and 2) that people of intelligence and conservative theology can embrace egalitarian views of Christian community and still be faithful to scripture. Very good collation of personal transformation stories of evangelical ministers coming to accept, embrace and endorse women in leadership and ministry. Validates Donald Green, political science professor at Columbia, “the key is when you personify an issue - in a positive way - people become more understanding." I'll write a full review on my blog in time. Suffice to say - I've not changed my mind about women in church leadership since reading this book. Also, I find it fascinating that for a book promoting the role of women in spiritual leadership, there aren't that many lady contributors - out of 21 chapters, 11 are written by men only, 6 are written by husband and wife teams, and only 4 are written by ladies only.